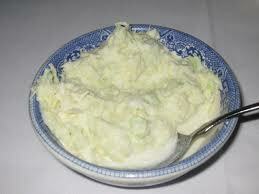 Place shredded cabbage in a covered dish in refrigerator for several hours. Mix remaining ingredients together in order given 30 minutes prior to serving. Toss cabbage and dressing together. Chill and serve. Another recipe that has had a home in our recipe box for over 30 years. This is such a great coleslaw recipe…and the Brookville Hotel Fried Chicken Dinner is AMAZING! If you’re in the “neighborhood” of Abilene, Kansas, be sure to make The Brookville Hotel one of your stops!